When we first moved into our wreck of a house, the end of the garden was dark and gloomy, overshadowed by trees. “How can I bring in some light into this space ?” I wondered. The answer was, of course, water. So I added a reflective pool- can you see the overhead leaves in it? I also added a pond, complete with jetty ( me, pretentious?! )and summerhouse. 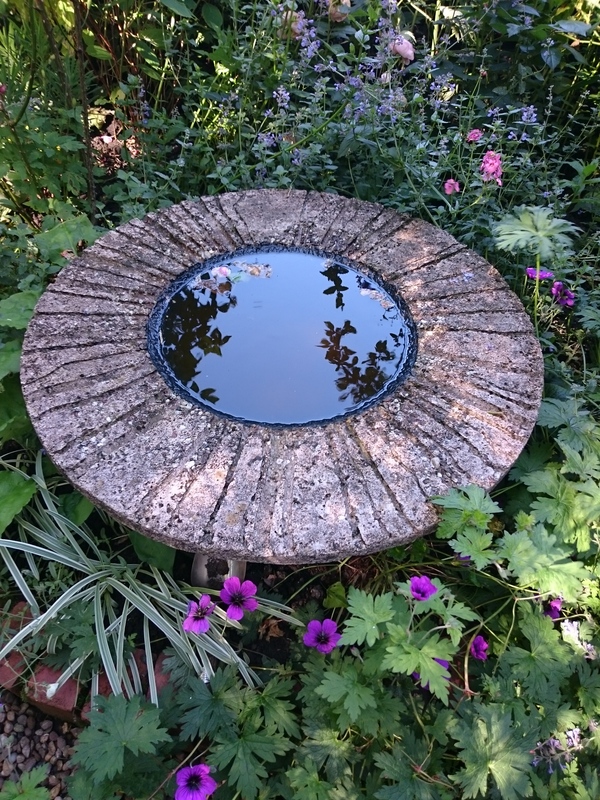 Water has wonderful reflective qualities, pulling light down from the sky and lighting up the darker areas you often find in town gardens.It’s lovely to sit in here in the evening, watching the clouds scudding across the sky above. The flat surface of the water presents an ever changing light show- better than the telly any day. A few years ago I was contacted by Mark in Didsbury who had a tall contemporary town house with a tiny scruffy garden in need of a revamp. One of Mark’s influences ( and mine) was the feisty Irish gardener Helen Dillon, whose Dublin garden is a visual treat that has just been sold off for over £4million ( Helen is 78 and needs to downsize – but how can she bear to leave?). Like many people she’d had years of living with a large central lawn but one day, bored and longing for more light, she decided to dig the whole thing up and put in a canal. No more mowing and the soft Irish light is sucked down into the space. The canal itself is only 18inches deep, stone lined and quite low maintenance. Mark said he’d quite like a canal himself so, despite his garden being the size of a handkerchief in comparison to Ms. Dillon’s, I obliged. Here we are clearing out and building. I met Mark in Aldi yesterday ( wish I could say it was Waitrose….) and asked if I could pop round and see what the garden looks like now, four years on and at the start of Autumn- not the best time he admitted, but he promised to sweep up. As in the Dillon garden, the canal is stone lined and only 18 inches deep. Mark loves the tall planting on either side which affords him a lot of privacy, he adores the heady scent of the roses, and most of all, the reflective properties of the water. Canals add a formal ground level water element which is ideal for the town garden where informal ponds can look incongruous. Canals bring in light, reflect the sky and clouds and give a sense of space to smaller spaces. Here’s a more recent canal that we built last year, complete with splash cascade. Time for a paddle anyone? Brilliant blog I have seen your garden with the sunhouse and bridge over water a coup!e of years back on an open garden day and remembered being very impressed with it. Thanks Mandy-glad you like it!